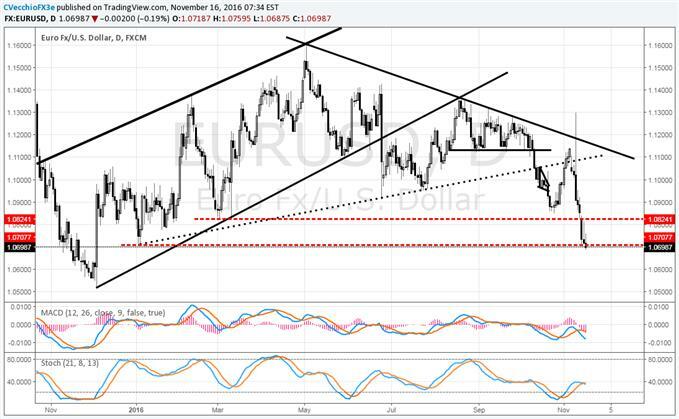 - EUR/USD is in at fresh yearly lows below 1.0800 as US Dollar romp continues. - US yields continue to run higher, underpinning a stronger Greenback, but equity markets are pausing; this is a concern we discussed in yesterday's note. - See our weekly data preview for outlooks on the remaining key data this week. The US Dollar is continuing its run higher across the board, with DXY Index setting fresh 13-year highs within a few minutes of publication today. 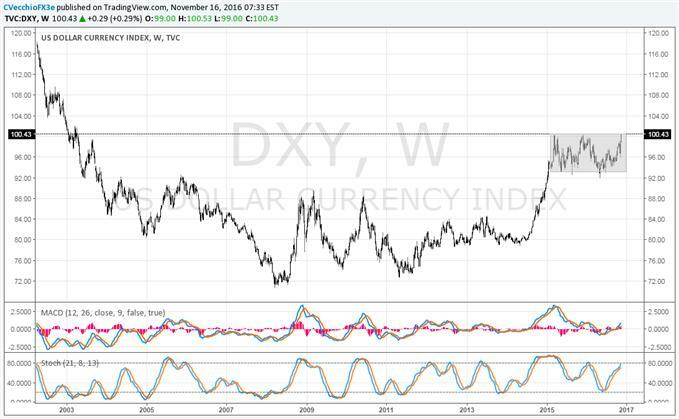 The historical record is noteworthy, but perhaps more relevant for trading is the context in which the strongest DXY levels being set since 2003 have occurred: after a near-two-year consolidation in the aggregate measure of the greenback. It's no surprise that it's taken fresh yearly lows in EUR/USD to get DXY to its highest level since April 2003: the Euro accounts for 57.6% of the headline index. Other currencies that have been under pressure like the Japanese Yen (13.6%) and the British Pound (11.9%) have played a role in recent days, but aren't in the limelight. For EUR/USD, there are two prime factors driving the pair lower. On the US Dollar side, the US Presidential election results have ignited a reflation trade that is sending US Treasury yields rapidly higher. Concurrently, with the ECB set to keep rates on hold at emergency levels and extend its QE program next while while the Fed hikes rates on the cusp of a wave of fiscal stimulus from President-elect Trump, interest rate differentials between US yields and their German and Italian counterparts are widening sharply in favor of a weaker EUR/USD. The second factor for EUR/USD is also related to the US Presidential elections: the rise of protectionism. The rise of nationalist movements in the Western world - be it Brexit in the UK or Trump's victory in the US - may have reinvigorated populist, anti-EU parties across Europe. In turn, the existential nightmare that Brexit wrought upon the Euro may be entering its next act. The first half of December will prove volatile for EUR/USD, with the Italian constitutional referendum (December 4), the Austrian Presidential elections (December 4), the UK Supreme Court Brexit hearings (December 5-8), the European Central Bank's policy meeting (December 8), and the Federal Reserve's policy meeting (December 14). The big picture for EUR/USD: it's in the midst of an historic streak of price consolidation. Read our Q4'16 forecast, "EUR/USD Coil Grows Tighter as Central Banks, Politicians Face Credibility Deficit." See the above video for a technical review of the DXY Index, EUR/USD, GBP/USD, AUD/USD, USD/JPY, USD/CAD, and Crude Oil.